"Last one downstairs is a rotten egg!" A challenge fit for Easter weekend, one delivered by The Bear to signify her readiness for a trip to the airport. She beat me downstairs, too, though I think she issued her taunt when already halfway down. Though our commute began under clear blue skies, we soon rolled beneath a 2100' ceiling hovering over the Williamson-Sodus Airport. We slipped low out of the area in the Warrior, found a large hole in the deck, and climbed on top. While climbing, I realized that this was exactly the scenario for which I earned my instrument rating. Why didn't I file IFR? A simple but inadequate answer: old habits die hard. A skittish wind at our destination in St. Mary's, Pennsylvania led me to flip-flop runway choice at least twice as we closed in on the field. Once I finally committed to runway 28, the rogue breeze shifted to a quartering tailwind such that we floated, bounced lightly on contact with the ground, and floated some more before settling solidly on the runway. I was tempted to log it as two landings. Once seated in The West Wind, I ordered The Aviator (a skillet of sausage, mushrooms, scrambled eggs, cheese, home fries, etc) and The Bear ordered pancakes and apple juice. The vat o' apple juice that the waitress placed before her was large enough to possess its own undertow. The Bear was not only extremely proud of this massive beverage, she also drank it all. As I contemplated the flight home, I wondered if there were any old diapers stowed somewhere in the airplane because that was a lot of juice to be contained inside one little girl. Magnificent pancakes, flecked with chocolate chips, served as sustenance and treat both. Meanwhile, the weather at home had lowered and Rochester was declaring marginal VFR conditions. From the flight south, I knew that temperatures below 6500' were well above freezing such that icing was unlikely to be a concern. I filed IFR for the return trip, choosing an airway route suggested by ForeFlight. Within moments of filing, the iPad binged to announce that I should expect my filed route. 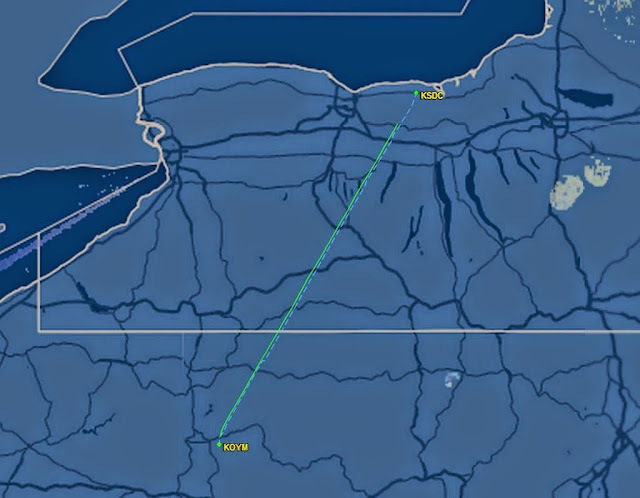 Instead, Cleveland Center cleared us direct to Williamson-Sodus at 5000 feet. Under clear skies, the aggressive terrain of northern Pennsylvania made for a rough ride home at this altitude. As the FlightAware track above demonstrates, I held my course well despite nearly continuous displacement from heading by staccato jolts of turbulence. Frankly, it was good practice to hand fly in such conditions and The Bear was entirely unperturbed by the rough ride. Closer to Rochester, we logged 0.2 hours of IMC, punching in and out of the clouds. The Bear loved this part. For me, it served as good practice in transitioning on and off instruments. 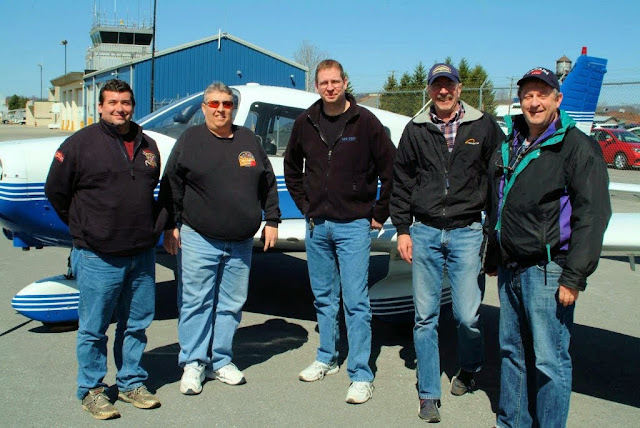 Williamson-Sodus was reporting clear skies and, once within fifteen miles of the airport, we cancelled IFR and landed. "Last one to the car is a rotten egg," The Bear uttered her challenge while already charging off down the airport sidewalk. I quickly overtook her and reached the car first. "What I MEANT to say was, last one IN the car." The Bear is a master of Calvin Ball and routinely switches the rules around to best suit her situation. But I had the upper hand. As The Bear struggled impotently against her locked car door, I strolled to my mine, clicked the key fob once (to unlock my door only), and slipped inside. There was no way that I was going to wind up a rotten egg this time, even if that meant cheating just a little. Two trips to the airport in a single day used to be rare for me, but now that Warrior 481 is hangared so close to home, such a feat is easily managed. Good thing, because I did not complete my post-flight responsibilities after returning late from a breakfast flight. At a minimum, I needed to bundle the airplane up for preheating: I had an early morning appointment the next day at Boshart Enterprises two counties over for the Warrior's annual inspection. That evening, after dinner (sushi! ), I returned to the airport in a more leisurely fashion than I left it. As much as I hated to move away from the Le Roy Airport, I really appreciate my ship being so close to home. It was a calm night with high clouds and I decided that it made a good opportunity to test fly the new LED landing light, an aptly named Whelan "Parmetheus". I decided to upgrade to the LED after a recent failure of the old-school GE 4509 bulb (a PAR36) made for a dicey night landing at home. I went aloft at sunset and played around in the sky until there was sufficient darkness for a good test. Briefly, the light works great. I should have made the switch sooner. I can only see one disadvantage of the LED light: it draws so little current that my habit of verifying a load on the ammeter during run-up is no longer a useful test for a functional landing light. I think I can live with that, particularly if the light is as durable and long lasting as claimed. With the lower current draw, I imagine that the ancient Chrysler alternator on the nose of my airplane will not have to work nearly as hard to light my way at night. The third time really is the charm. Gary from Gary's Flight Journal and I have tried to meet up a couple of times previously, but never quite managed to connect. Weekend chores and dead airplane batteries take their toll on pilot's social lives. With winter on the decline, the door to the cage (i.e., the local area) was finally left open for a trip across state lines. I suggested to Gary that we meet at Cloud 9, the nice restaurant on the field at Williamsport Regional Airport (IPT). Williamsport fit the bill perfectly, a worthy destination located halfway between Rochester and Gary's home base in southern Pennsylvania. Knowing that he had been out of the air for a while, I invited fellow aviator Joe to join me in the Warrior. It was Joe who recruited me to move to Williamson in the first place and Warrior 481 resides in his former hangar there. He is also a "power-broker" (heh... OK, moderator) of an aviation forum that Gary and I both use such that they were aware of each other. Our flight south was smooth, hastened along by a 20-ish knot tailwind. I chose to file IFR that morning just for practice in the system. As we approached Williamsport, New York Center was unable to contact the tower at the airport and offered me a hold at the Williamsport VOR. Though a real world hold assignment would have been great practice, we were already running ten minutes late. I cancelled IFR and contacted the tower directly. I need not have worried, Joe and I were the first to arrive. From our table at Cloud 9, I watched for Gary's red and white Beech Sundowner to land. Unlike my previous visit to Cloud 9, the ramp quickly filled with airplanes and the restaurant was quite busy. Joe and I watched Gary and Bob taxi to the ramp in 08R. Little did we know that Gary was bringing an entourage with him! Not long after Gary and Bob arrived, we were joined by Adam and Gary S out of Doylestown, PA. Though the service was a little slow, breakfast was good and the company was terrific. Conversation flowed easily back and forth. At one point, discussion turned to a group of characters we all knew from some of the aviation forums and how their on-line incarnations sometimes differed significantly from their real world selves. Gary opined that he was exactly the same on-line and in-person. I had to laugh, because he was absolutely right. I know that I will enjoy Gary's blog posts even more going forward now that I will be reading them in his voice. Funny, somehow I always imagined him as a bass! Bob C, Gary M, me, Gary S, and Adam Z squinting into the sun. Photo by Joe. I thoroughly enjoyed breaking bread with a terrific group of kindred spirits. But when I noticed that the time had crept past 11:00 am, I knew that we needed to start the journey back home. Kristy and I had tickets to a show in downtown Rochester at 2:00 that afternoon. Gary had parked 08R right next to 481, which served as a perfect photo opportunity. When pilots meet, it is a moral imperative to check out each other's ships. Warrior 481's freshly installed LED landing light (a cleverly named Whelan "Parmetheus" replacement for the original PAR36 bulb) garnered a lot of attention and interest. Unfortunately, I had only tested it against the inside of my hangar door and could not provide much of a report on how well it worked. I committed a bit of an aviator faux pas because, in my hurry to depart, I did not take the opportunity to examine Gary's immaculately maintained Sundowner up close. Next time, Gary! Gary was the first to fire up and was already at the departure end of the runway while I was running my engine start checklist. I was alarmed when I put power to the avionics and heard Gary inform the tower, "...08R aborting take-off." Gary's subsequent communications made it clear that the problem was merely an unlatched door rather than something more sinister. Once established at a VFR cruise altitude, I passed control to Joe who flew us home. It was a race against the clock, this time upstream rather than down. At best, we managed to achieve 105 knots groundspeed. Back at Williamson, Joe helped me push the Warrior into the hangar. I simply shut the door and ran for the car; tidying up had to wait. At the wheel of the Accord, long dormant Oakland County, MI driving habits kicked back in and I "compensated" as best as I could for lost time. Kristy and I reached the downtown Rochester exit at the time the show was scheduled to begin and reached the theater door five minutes late. This worked out well because the show, a thought-provoking play called "Informed Consent" in its world premiere run, actually started six minutes late. They must have been waiting for us.